Headcount and staff costs form part of operating expenses, and can be a major expense to consider when preparing a financial projection. Staff costs relate to the costs of having employees, they include the basic payroll expenses such as wages and salaries, but also fringe benefits and perks such as holiday pay, subsidized meals, cars, pension schemes, life insurance, childcare assistance, and employee discounts together with employer taxes. The Excel headcount and staff cost calculator, available for download below, allows for up to four departments, a markup percentage, and annual inflation. The calculator is used by entering details of each employee such as job title, basic annual salary cost, whether part time or full time, and start month. The start month can range from 1 to 60 months and the calculator will calculate the relevant cost for a particular year. Additional on-costs such as benefits, perks, taxes are allowed for by applying a mark up percentage to the basic salary costs. The second page of the calculator provides a summary of total staff costs and headcount by department. The staffing projection template is available for download in Excel format by following the link below. Users use this 5 year headcount plan and staff costs calculator template at their own risk. We make no warranty or representation as to its accuracy and we are covered by the terms of our legal disclaimer, which you are deemed to have read. 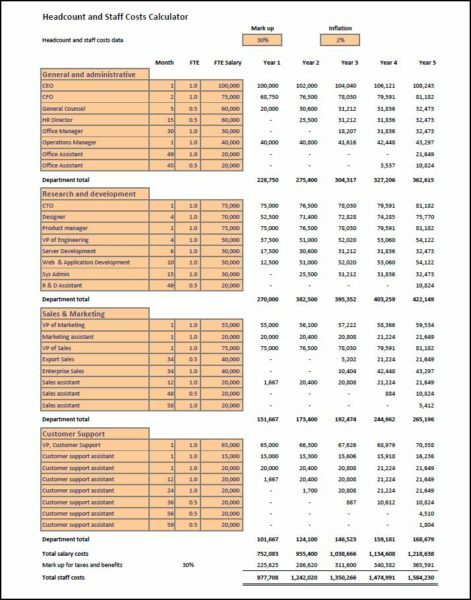 This is an example of a headcount budget template that you might use. It is purely illustrative. This is not intended to reflect general standards or targets for any particular company or sector. If you do spot a mistake in the headcount forecasting template calculator, please let us know and we will try to fix it.